Some of the links below are affiliate links, meaning, at no additional cost to you, I will earn a commission if you click-through and make a purchase. One of the perks of my job is all the truly Awesome bloggers I meet on a daily basis! Talented women who love to bake, cook, and create recipes. 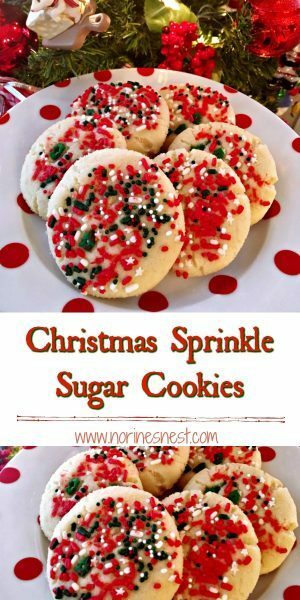 Recipes like these amazing Christmas Sprinkle Sugar Cookies! This recipe comes from my friend Emma of motheralwaystoldme.blogspot.com . They were everything I hoped they would be! Light, buttery, crispy, not overly sweet, and so tender they melt in your mouth. I asked Emma if I could share her recipe here at my Nest this Holiday Season? She was more than gracious and agreed. Each day I’ll share one of their recipes on my Facebook and Instagram stories. Next week I’ll do a special “round-up” of all the recipes so you can make them this Holiday Season for your family and friends. 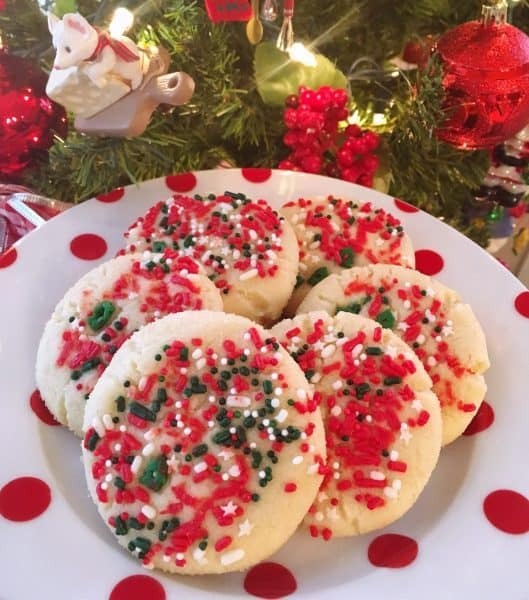 Let’s Make Christmas Sugar Cookies! Beat until well combined. Add 1 beaten egg and 1 teaspoon vanilla. In a separate bowl mix together 3 cups flour, 1 teaspoon baking powder and a pinch of salt. Whisk dry ingredients together. Set aside! 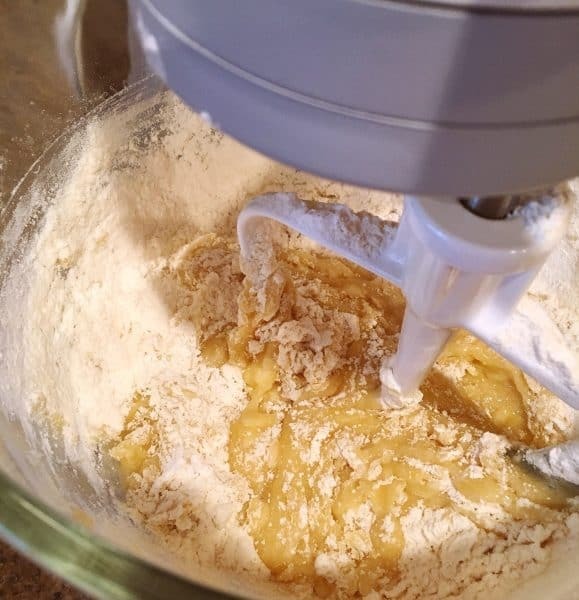 TIP: Recipe calls for flour to be sifted. 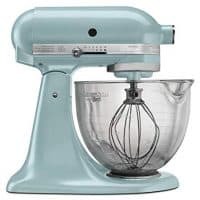 However, mixing dry ingredients together with a whisk until well combined will create the same effect as sifting. In a small cup, or bowl, add 1/2 teaspoon soda with 1/2 teaspoon hot water. Add baking soda to wet ingredients. Mix well. Now back to those dry ingredients! 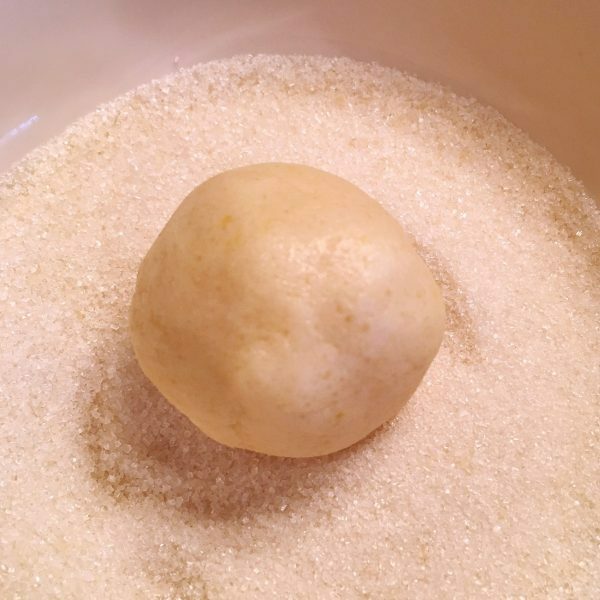 Form dough into a soft ball and place in a covered bowl. Chill for 30 minutes. 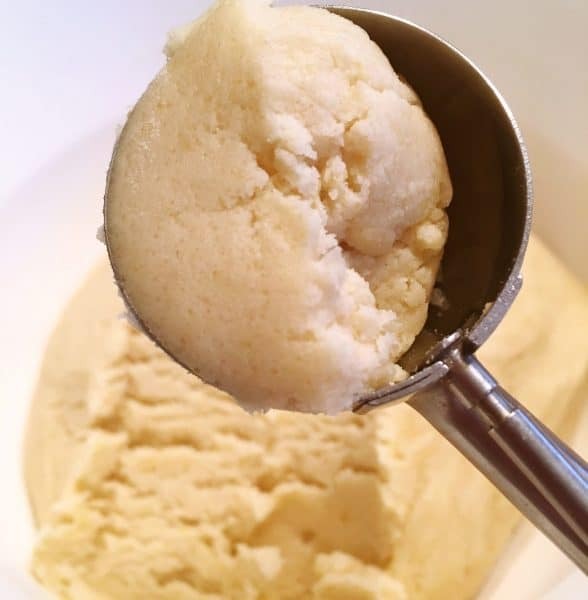 This will help firm up the dough so it’s easier to handle. Dip one side of the cookie dough ball into a bowl with about a 1/2 cup granulated sugar. 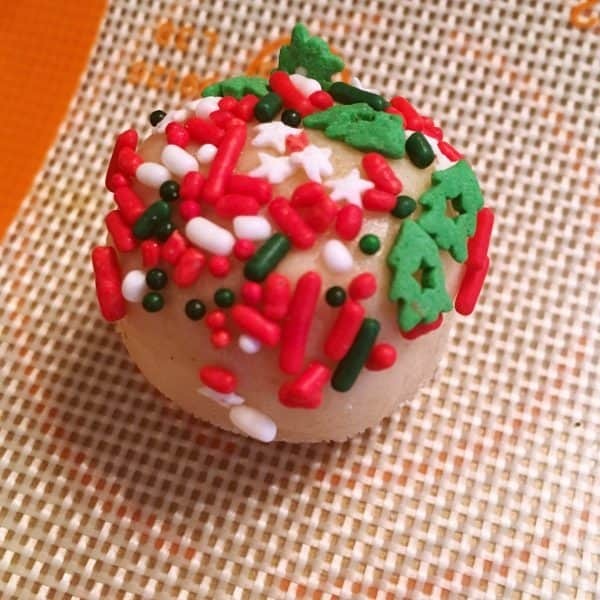 Place cookie dough ball, sprinkle side up, on a silicone or parchment lined baking sheet. 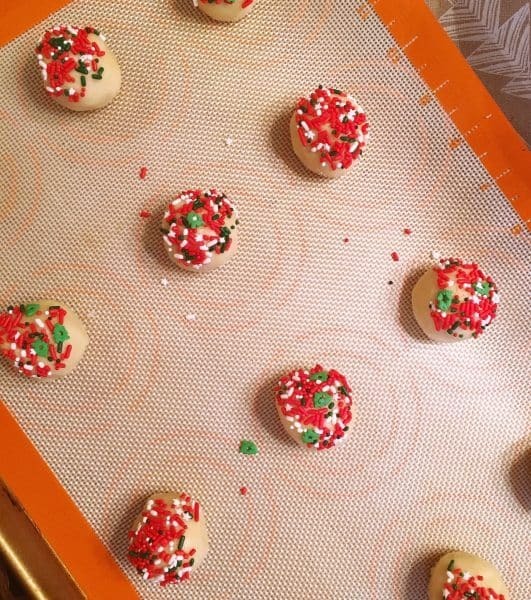 Once you have a dozen cookies on your lined baking sheet, place in preheated oven on center rack. Bake for 5 minutes. 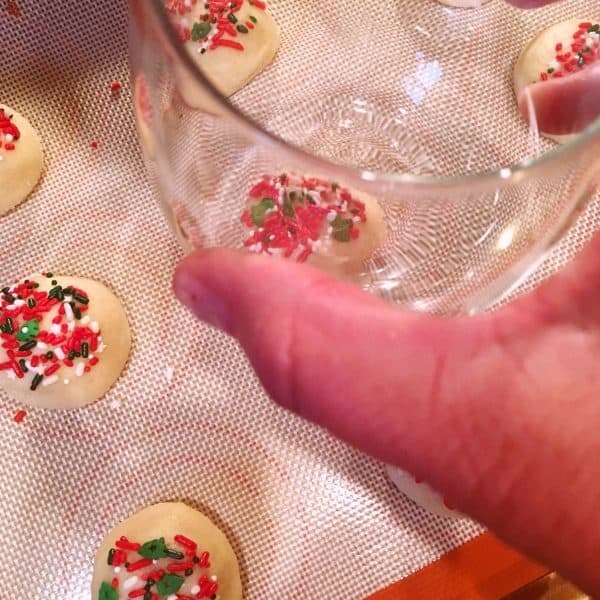 Half way through baking use a glass to gently press down cookies… OR…Keep reading…this is an important “OR”! 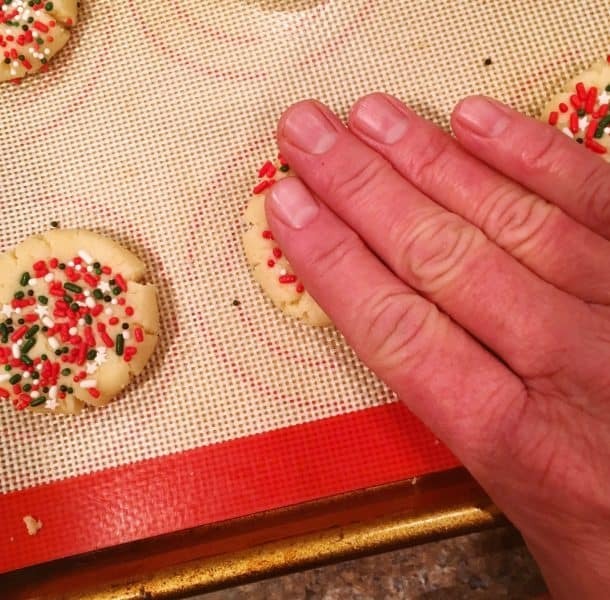 You can also gently press dough down before placing cookies in the oven. Either will work. I preferred using my hand. 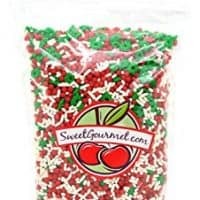 The sprinkles tend to melt and stick to the bottom of the glass. However, the glass does create a prettier cookie with nicer edges. Bake for an additional 5-6 minutes until centers are set. 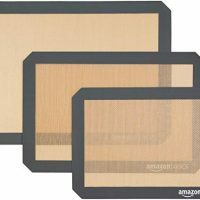 TIP: Switch cookie baking sheets on oven racks half way through baking. This will create a more even cooking time. I do this little trick with all…ALL my cookie baking! These cookies are SO good! Emma’s Grandma Jones, was one heck of a sugar cookie expert! I changed a few of the procedural things…but other than that…this is her recipe! I can’t take credit for it. What a wonderful gift she left for her family! 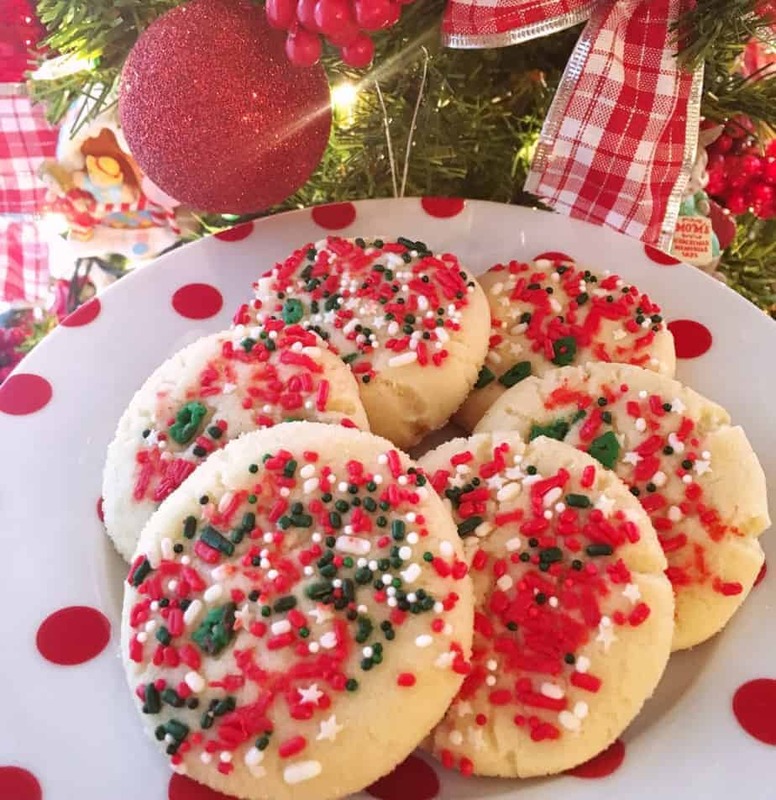 I do know this…Grandma Jones Christmas Sprinkle Sugar Cookies will ALWAYS, from hence forth, be part of this Nest’s Holiday Cookie Traditions! This is the perfect “dunkin’ ” Cookie! 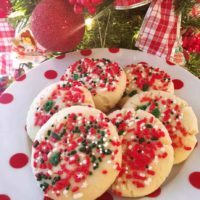 I’m not usually a huge sugar cookie fan and this recipe has changed my opinion of sugar cookies! 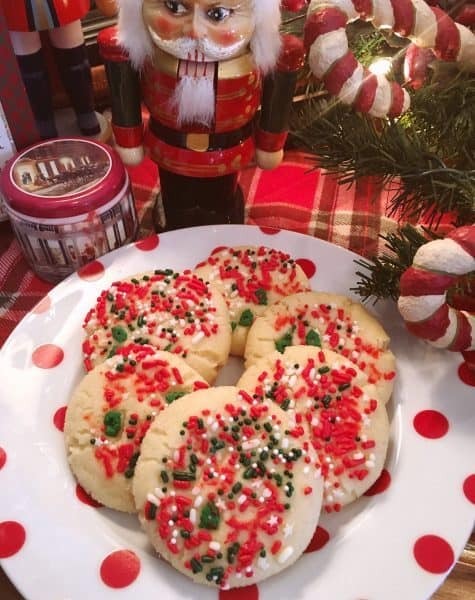 I know one thing…they’re sure to be Santa’s favorite Christmas Sugar Cookie this year! I hope you’ll follow me this week over on Instagram and Facebook for all the delicious cookies my friends will be sharing that will be part of this weeks Virtual Cookie Exchange! Bring your mug… or your Dr Pepper if you’re like me, and tag along! We’re going to have SO much fun! And… the Holidays should always be fun!!! I’m sharing this fun recipe over on two of my favorite link parties. Click on the links to join the FUN! Light, crispy, buttery, slightly sweet sugar cookies that melt in your mouth! 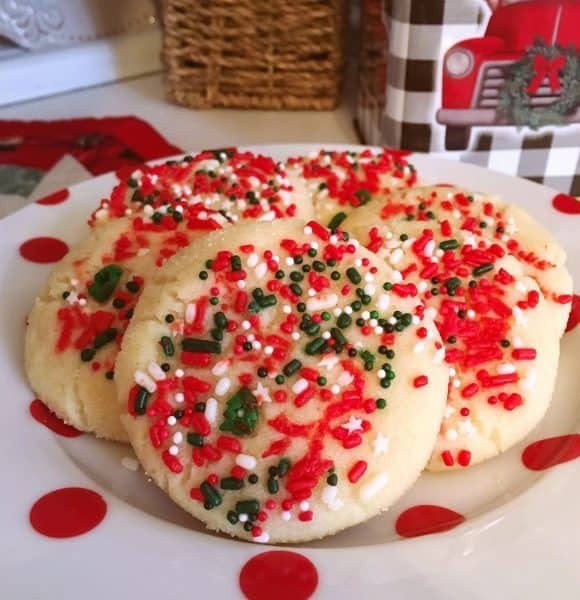 The perfect Sugar Cookie for your Holiday Cookie Exchange! 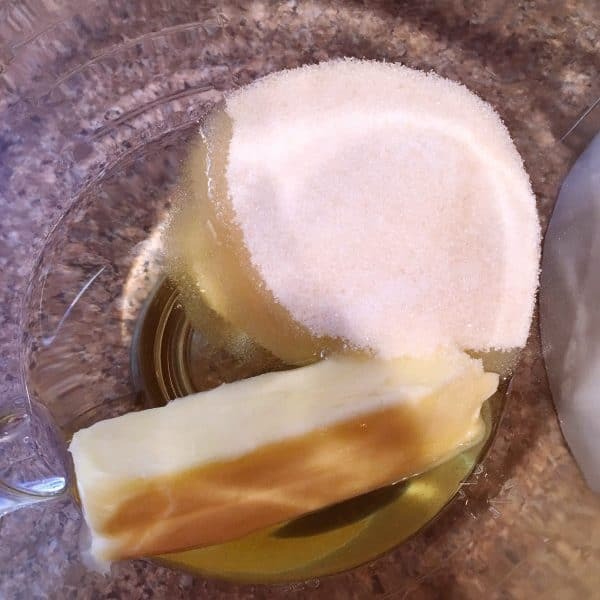 In bowl of mixer, add oil, butter, and sugar, mix well. Add beaten egg and 1 teaspoon vanilla. Mix until well blended. In a small bowl or cup, combine together 1/2 teaspoon hot water with 1/2 teaspoon baking soda. Add to wet ingredients. 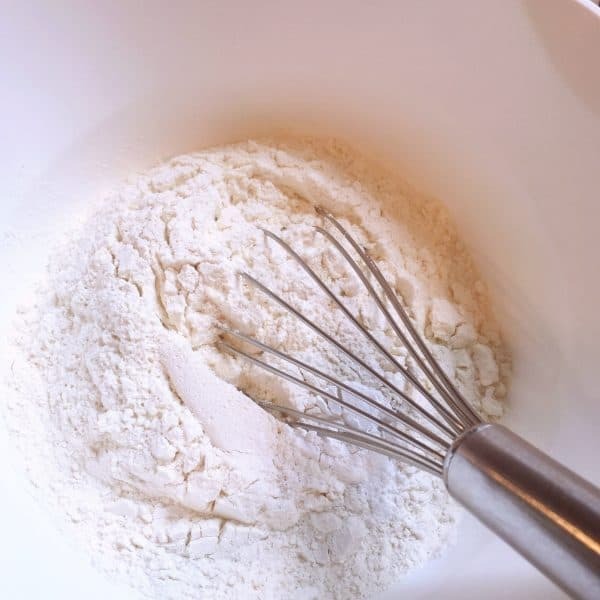 In a separate bowl, using a whisk, whisk together 3 cups of flour, 1 teaspoon baking powder, and pinch of salt. Add to wet ingredients. Mix well. 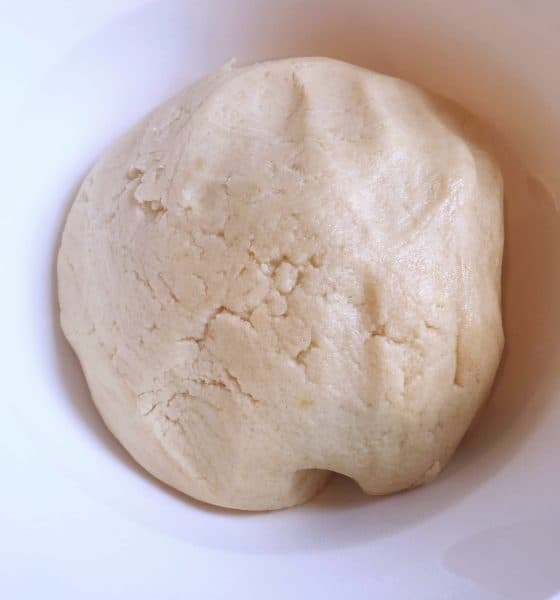 Form dough into ball. Place in covered bowl and chill for 30 minutes. 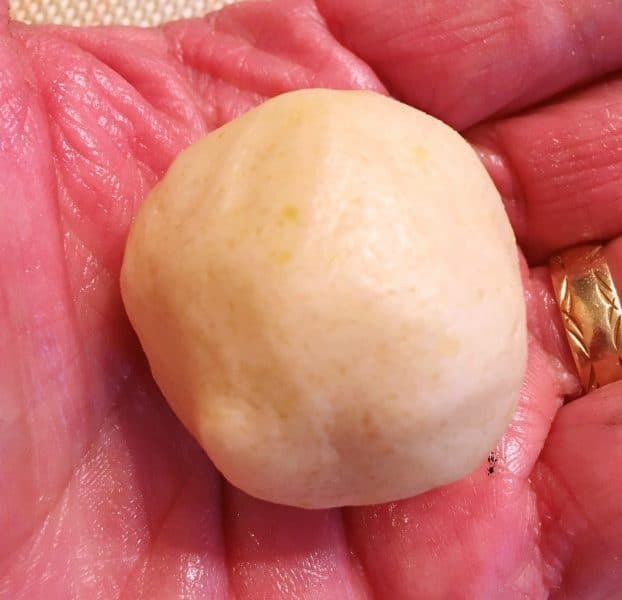 Remove dough from refrigerator and roll dough into 1 1/2 - 2 inch ball. Dip one side of ball in sugar and top side of ball in sprinkles. 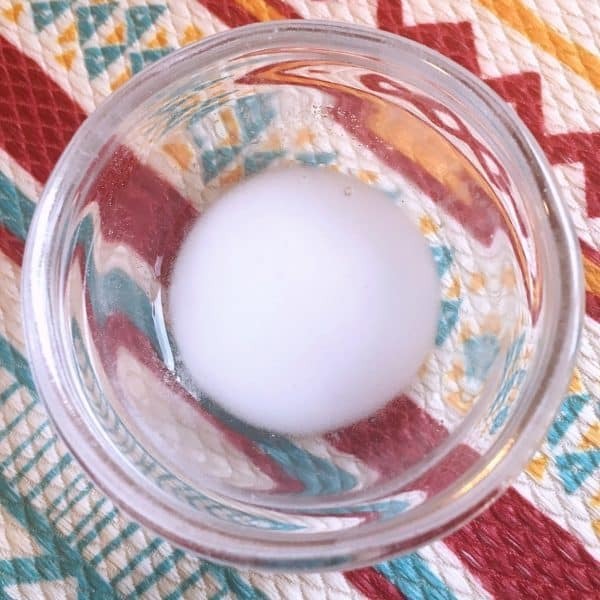 Place balls on parchment lined cookie sheet about 3 inches apart. Press dough down gently with fingers to about 1/2 inch thick. Place baking sheets on center racks. One up , one down. Half way through baking trade racks. Bake for another 5-6 minutes. Place cookies on cooling rack. Store in air tight container. These are beautiful and so delicious! I’m ready for all the Christmas baking! Thank you so much! You are the sweetest and best! Can’t wait to see your addition this week!